Captain your very own Capital Ship in this free to play aerial armada MMO where players control huge ships and face off in epic cinematic battles, focusing on strategic planning and on the fly tactics, Dreadnought is a different breed of space shooter where the nimble agility of a fighter is put to one side and players experience pure power of a battleship. At its core Dreadnought is a space shooter, but instead of flying fast and agile fighters as you would traditionally see, instead players control hulking structures the size of cities that drift through the skies and space in deadly battles. Due to the slow pace and lack of mobility for most ships the combat style is a lot more tactical and players need to think careful about each maneuver they take; getting into trouble is easy but getting out might not be possible and so keep cover, preparing ambushes and watching your positioning and paramount to survival. There are five ship classes in the game: Dreadnought, Tactical Cruiser, Artillery Cruiser, Corvette and Destroyer. Up front and leading the pack are the Dreadnoughts, the biggest ships on the field with heavy armor, slow movement and slow attack speed these floating fortress like constructs can unleash powerful broadside batteries and a handful of missiles, but their offensive output is their biggest weakness. In contrast the Tactical Cruiser is all about damage, trading off defensive capabilities, it sits comfortably at the back shooting down enemy ships at long range. Destroyer-class ship find the balance between defense and offense, weaker that both the Tactical Cruise offensively and Dreadnought defensively, it also lacks each ships weaknesses and so is overall a much more balanced capital ship. The Tactical Cruiser supports the other ships, whilst able to deal damage it functions primarily as a healing ship to keep allies in the battle. Finally the Corvette, the smallest of the ships, its primary function is to upset the backlines, going deep with run and gun tactics, dealing damage and then getting out before it is destroyed. Each ship has four available modules for different areas , with each module having a number of different specific options to choose from pre-battle to determine the class/ships loadout, which will change the ship cosmetically but also enable to player to have four unique skills at their fingertips to use in battle. Modules vary depending on the class, the ship and the module area and so offers a wide variey of customization options for players. As well as the different skills that players have control of they can also have hands on control of their ships energy and directing it into various systems depending on the scenario; pushing energy into Engines will give the ship more speed, Shields will bolster its defenses, and Weapons will give it more firepower. When diverting power it makes the other two areas weaker, and so players must be careful when they do this and switching between them takes skill and timing. There are multiple maps available in the game, ranging from battle in space around enormous stations and fighting through asteroid belts, or down in lower orbit, flying through the skies, weaving through deep canyons and navigating across snowy mountains. The two primary game modes focus on the same objective: destroy all five of the enemy capital ships, however these are done differently. Team Deathmatch is an outright battle, when a Capital Ship meets its end then the player must sit out the rest of the match and can only spectate, switching between allied ships. 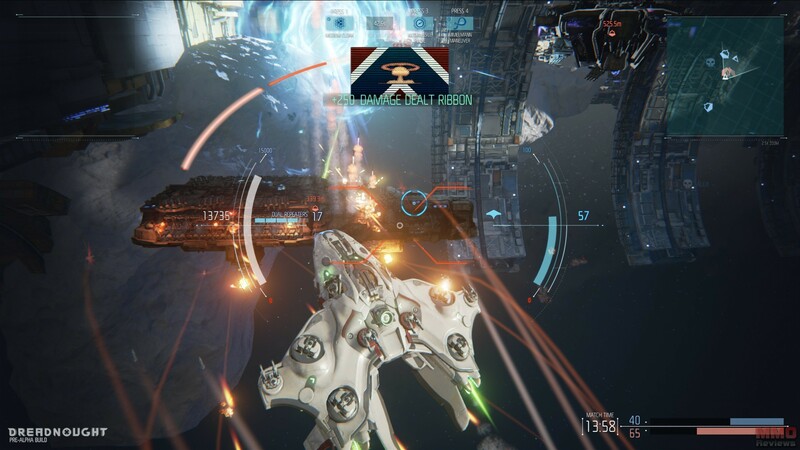 In Elimination players actually get to jump back into the game when their Capital Ship is destroyed, but playing as fighter ships instead; these ships have weak defenses and damage output, so can’t go one on one with the remaining enemy Capital ships, but they are nimble and agile and so can harass them and try to pick away at their defense. Looking for more Free MMO third-person shooter,Free MMOs,Free MOBA Games games?